It’s hard to describe the sheer anguish and frustration of living in a flea-infested home without experiencing it for yourself. These blood-sucking parasites will actively find their way onto your skin where they draw blood and leave behind itchy, swollen red bumps. You can use all the “flea bombs” and “foggers” you want without making a dent in their numbers. With flea infestations causing so much trouble, many homeowners find themselves asking the following question: how long can an adult flea live? The lifespan of an adult flea varies depending on a number of different factors. Humidity (or lack thereof) is one such factor that will greatly impact the flea’s lifespan. Fleas prefer a moist, humid atmosphere to thrive and reproduce. This is why individuals and families living in exceptionally arid regions rarely experience flea infestations. And if a flea infestation occurs in an arid region, it usually goes away without any work on the homeowner’s part. Several studies have found that flea eggs need a relative humidity (RH) of 70-75% to hatch, and flea larvae need 50% or higher RH to survive; therefore, lowering your home’s humidity can prove to be a highly effective way to lower fleas’ lifespan. Consider installing a dehumidifier (or several) inside your home to discourage fleas. Temperature is another factor that will impact an adult flea’s lifespan. Fleas prefer warm climates of 70-90 degrees Fahrenheit. If your home’s temperature is below 70 degrees, adult fleas will struggle to survive, which in turn lowers their lifespan. The use insecticides, pesticides and flea treatment products will reduce the lifespan of an adult flea. Some products work instantly, killing fleas on contact, whereas others are slower, gradual neutralizing the flea by blocking its neurological receptors and/or inhibiting its growth. Generally speaking, most adult fleas will live between 80-100 days in ideal conditions. 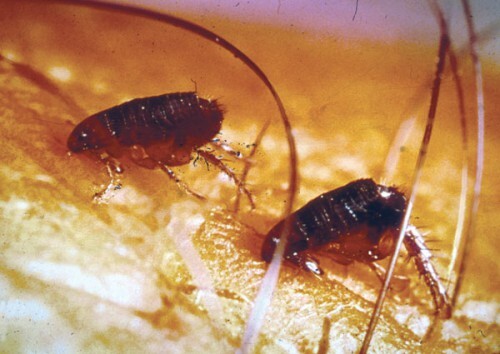 Fleas are finicky pests, though, and they prefer a very unique type of climate — one with high heat and high humidity. If you’re struggling to control a flea infestation in your home, try to create a climate that’s less appealing to these blood-sucking parasites. Dropping the thermostat and turning up the dehumidifier can make a world of difference. Of course, you can learn more techniques on how to exterminate fleas by browsing through our site here at FleaBitesonHuman.com. We have dozens of helpful articles, tips and how-to guides centered around fleas and flea infestations.